Offering you a complete choice of products which include submersible dewatering pumps, construction dewatering pumps and single phase dewatering pumps. “AQUATEX” dewatering pumps are virtual workhorses that can take on the toughest chores. 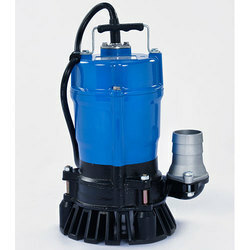 Ideal for draining flooded basements and storm water drains as well as other high discharge applications. Open type impeller prevents clogging of small solids and allows sand and silt to pass through. “AQUATEX” CDT high performance construction dewatering pumps can take on the toughest construction sites by virtue of their rugged cast iron construction and superior design. Perfect pumps for highly abrasive sand and silt laden water at construction sites. Heavy duty high Head / high Volume dewatering pump. Designed to pump highly abrasive sand-laden water in construction sites and mines. Maximum submersion is possible due to mechanical seal's resistance to high pressure. Designed for efficient motor cooling by top discharge flow. 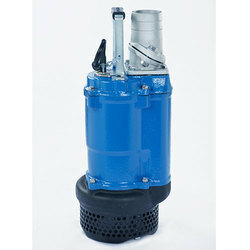 Top mounted outlet renders pump suitable for installation in confined spaces. Dual mechanical seal with two silicon carbide sealing ensures durability. 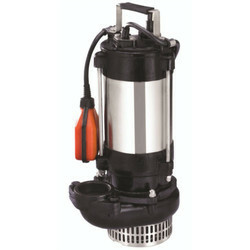 Pumps can be installed at greater depth as mechanical seal ensures water pressure up to 10 kg/cm2. Oil lifter providing effluent lubrication and cooling effect to mechanical seal extends mechanical seal life. Double shielded permanently lubricated high-temperature deep groove ball bearings extend operational life. Built-in thermal overload protector prevents motor failure due to single phasing and overloading. Anti-wicking cable entry prevents water incursion into the water. Semi-open, High Chrome iron impeller with ductile iron wear plate increases wear resistance when pumping water with abrasive particles. Designed to feed the water along the channel through to discharge flow for effective cooling of the motor. Draining sand-laden water in construction and civil engineering sites. We offer Single Phase Dewatering Pumps (Single Phase Portable Sub Construction Dewatering Pumps) to our clients. Wear parts made of abrasion resistant materials ensuring durability. Capable of pumping sand and silt-laden water with minimal wear and clogging. Ease of maintenance. The pump can be dismantled and assembled using a single 13mm box wrench. Built-in shaft mounted agitator prevents the 'airlock' that tends to take place on vortex impeller. Single phase, Dry type, Submersible, 2 Pole Induction Motor. Capacitor run, Class 'E' Insulation motor. Oil lifter provides efficient lubrication and cooling of seal faces extending mechanical seal life. High quality double shielded motor bearing. Anti-wicking cable entry prevents water incursion into the motor. Large channel in the spiral casing allows sand and sin-laden water to pass through easily. Urethane Rubber, Semi Vortex Impeller for maximum durability and pump performance. Dewatering sand and silt-laden water from foundation and civil construction sites. Draining stormwater from basements of buildings.